Cyclists in the City: Swept under the carpet - TfL promised minimum safety standards for cycling in 2005. So why has it ignored those standards ever since? Is the Mayor negligent? Swept under the carpet - TfL promised minimum safety standards for cycling in 2005. So why has it ignored those standards ever since? Is the Mayor negligent? Last month, Andrew Boff, Conservative Assembly Member explained via a comment on the Evening Standard's website that he wants TfL to; "Prepare and publish a design guide to inform and instruct all future [road] schemes." His idea is that TfL should apply minimum cycle safety standards. The thing is, London already has minimum cycle safety standards. And in 2005, Peter Hendy (then managing director of surface transport, ie head of London's roads and now TfL commissioner, ie the big cheese) wrote a letter about those cycle standards. 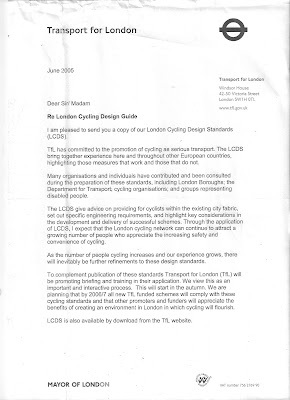 In that 2005 letter Peter Hendy said this: "all new TfL-funded schemes will comply with these cycling standards." I am hugely grateful to the hard work of the people at Camden Cyclists (and if you live in Camden or work there, get involved with them) for keeping an original version of that letter, which you can see at the top of this post. 'These cycling standards' are the snappily-named London Cycling Design Standards, the result of several years work and a vast amount of money. They're not amazing and they are inferior to current American or European standards but they are London's own standards all the same. They're still there, lurking in a dark and dusty corner on TfL's website and you can have a peek at them here. But they've never been applied. In fact, I'd go as far as to say that since Boris Johnson came to power, TfL has built schemes that consistently contravene its own cycling safety standards. But ever since he committed to these minimum cycle safety standards, the man who is now in charge of TfL day-to-day has, in my view, completely ignored them. And my belief is the current Mayor has encouraged that to be the case. "TfL with the vast resources available to it has been managing a junction for years that does not comply with its own design guidelines, despite stark warnings about safety in reports TfL itself commissioned. This reinforces my calls for a proper investigation of TfL under the Corporate Manslaughter and Homicide Act"
Or let's take a look at a brand new TfL junction in Barnet. Take a look at this excellent before and after video of this brand new junction. You can see that slip roads have been added and that they make this junction considerably more dangerous to cycle through. What do the London Cycle Design Standards say about this? 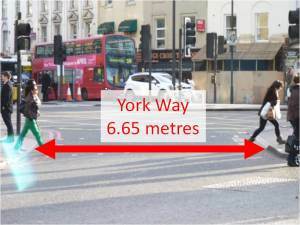 "To reduce the distance where cyclists are vulnerable, the slip lanes should be removed completely by re-configuring the junction or, where this is not feasible, reduced..." In other words, the brand new, hugely costly TfL scheme shown in this video blatantly ignores the London Cycling Design Standards. Let's look at a few more. "If a junction is to remain of the priority type then the choice of which movements have priority should be reviewed to optimise cycling movement, both in terms of waiting times and safety". In other words, at any newly-designed major TfL junction (say, Blackfriars for example), cycling should be given safe and convenient routes through the junction. Someone, somewhere has decided to ignore this part of the document as well. In fact, the Mayor's re-election team consistently boast how he is rephasing traffic lights in favour of more and more cars on the road, not in favour in pedestrians, old people, children or people on bikes. "Where appropriate and feasible priorities at cross roads should be changed so that cyclists on a cycle route do not have to give way" In other words, you should be able to cycle without giving way to small side roads. If can think of only one tiny side street where that's actually happened, I'd love to know of another one. I can't think of any at all. None of this has happened. Someone, whether it is the Mayor or whether it is someone senior at Transport for London, will have taken the decision to ignore the cycle safety standards and just swept them under the carpet. Which leaves the obvious question - Who took that decision and when? What is clear is that since the current Mayor came into power the minimum London cycle safety standards have simply not been applied. "The Mayor’s desire is that reviewing these junctions leads to a step change in the way engineers think when planning road layouts. Historically our roads have been designed with motorists in mind. But that must change and the Mayor intends that with thousands more Londoners taking to two wheels their needs be given greater consideration than ever before." We've had one set of standards to make cycling a safe and sensible alternative for Londoners already. I'll believe Boris's standards if and when he ever builds them. For the time being, I think cyclists would have a good case to claim Boris Johnson has been negligent with their lives. UPDATE - A lot of people will be gathering tonight at Kings Cross to protest about the Mayor's intransigence on cycling safety. You can read about what's happening in today's copy of The Independent here. 6pm Kings Cross, supported by Green party candidate Jenny Jones. You can sign up for email alerts about the Mayor's cycling safety plan on this page here. 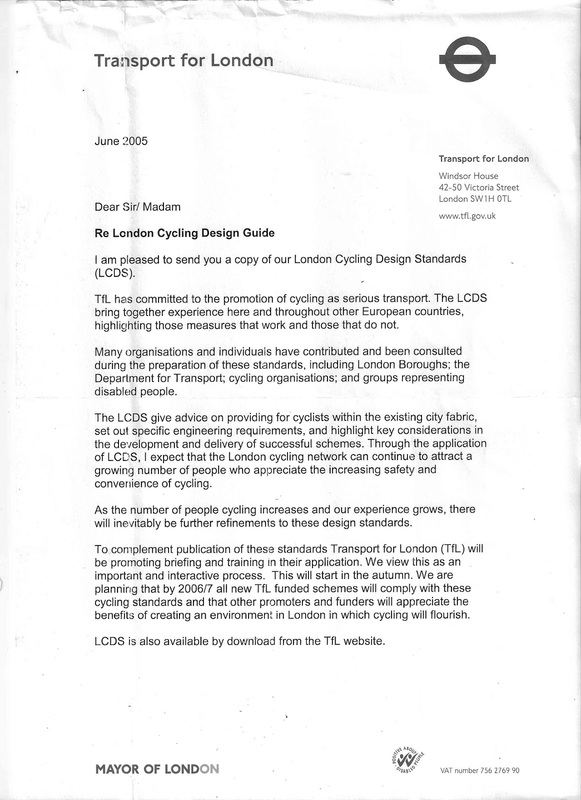 Actually, the second edition of LCDS (LCDS 2) has been developed by TfL. It is not officially launched yet, but should be at some time soonish - you will have to find out from TfL exactly when. Cycled the "superhighway" route to Stratford a few times last year, it's to be hoped no Olympic cyclists try to get there by bike, or the games will be lacking a few competitors. Lethal. Interesting that a 2nd edition has been developed. It wouldn't surprise me if its release is being deliberately delayed because of the desire to avoid bad publicity, as with the new London Road Safety Plan which was meant to come out for consultation in summer and then November 2011. Here's a bit more on the London Road Safety Plan: it's been 'about to be published' for a couple of years now. To my knowledge there is no comprehensive design guide (i.e: one that guides design rather than a set of standards). It's the difference between a recipe and a menu. I think we need to control the content of future designs rather than just allowing designers to choose from a list of best practice. Jenny Jones is against the idea but I will be attempting to persuade her and the other members of the Assembly that in order to hold TfL to account, we need to know how they are constructing road schemes, not just what options were available to them. I am not entirely sure I understand what your are proposing. The advantage of a recipe, to continue the analogy, is that you can scale it to the size of the meal, a disadvantage is that you may not add enough salt. A set of design principles certainly hasn't prodced results, but whether that is because the principles are not enough for the engineers to understand what is needed, or because they have been ignored, is a moot point. If the designs were more explicit, actually a set of plans, it would be harder to ignore them and perhaps more would actually materialise on the ground, but is that an ambitious goal? How many sets of plans would it take to cover all the major variations in size and layout or streets and junctions? What would be the effect on sites which deviate significantly from the norms? Hardly good, I imagine. esp places where tfl goes on the record to say that they are not implementing a pro-cycle safety scheme because it disrupts traffic flow. what would be good is a set of rules saying, this is what you must/must no do in certain circumstances - for example, you must not make cyclists filter across traffic lanes when traffic is above a certain level, if there is no dedicated/segregated cycle lane, the speed limit must be 20mph. that kind of thing. Here's some video footage of that particular location "in action". See the car driver trying to beat the cement mixer through the pinch point, but having to stop before setting off again. Later we see a bus and a car within a few inches of each other crawling past the traffic island. This awkward merging, as well as producing bad riding / driving conditions, would also make it more likely that traffic blocks the box junction and/or pedestrian crossing.